Nevada almost fought their way back into the game with a major run fueled by rabid full court pressure but ultimately the Gators held on to a 70-61 win, advancing to the round of 32 where they will face the winner of 2-seed Michigan and 15-seed Montana. 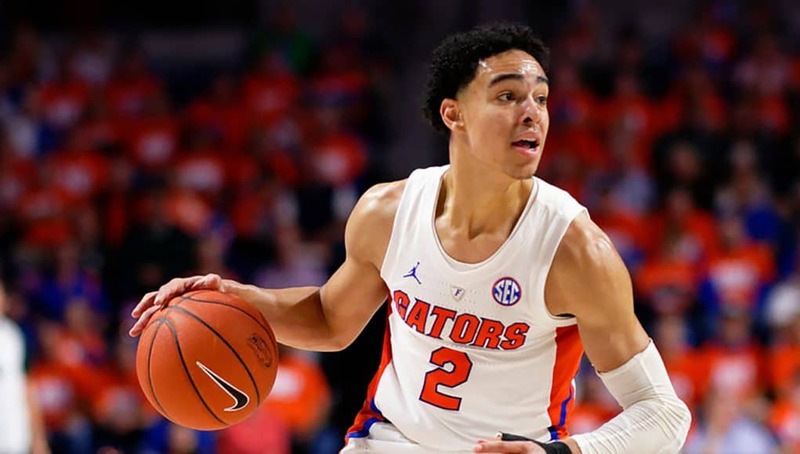 The first 28 minutes of the game looked like a breeze for Florida as they ballooned their lead to 18 points but with a team full of seasoned veterans the Nevada Wolf Pack went to a full court defense that sped the Gators up, forced turnovers, and baited them into taking bad shots. Even though their lead shrunk to a single possession they were able to get some key buckets from Dontay Bassett and Andrew Nembhard that gave them enough of a cushion. With Nevada down by 6 needing a score with less than 40 seconds left the Gators went to an extended 1-3-1 zone that confused the Wolf Pack as they passed the ball around for 20 seconds before missing a three, and when the Gators secured the rebound they also secured the victory. 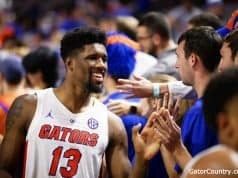 Florida’s trio of seniors Kevarrius Hayes, KeVaughn Allen, and Jalen Hudson all played some good basketball tonight and that was exactly what the Gators needed to survive and advance. Hayes lead the way with 16 points and played tremendous defense on the other end and when he needed to go the bench with foul trouble there was a noticeable drop-off. Hudson had three big 3-pointers that helped establish the lead in the first half and Allen had a variety of tough mid-range jump shots that deflated Nevada. Florida is going to need their veterans to play big for them to continue in the Big Dance but I’d say they got pretty good production tonight. Florida was really locked in defensively tonight against a big Wolf Pack team that loves to score off isolation plays and the Gators held them to only 34% shooting from the field. They really slid their feet and stayed in front of their checks, allowing the rest of the players on the floor to stay and home and not have to come help. That meant Nevada wasn’t able to get catch and shoot 3-point opportunities and that made their defense suffer. Another thing the Gators did was force a ton of turnovers, 14 to be exact, and against a Nevada team that has far and away the oldest rotation in the country that is an extremely impressive feat. 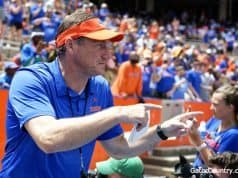 Bringing their A-game on the defensive end pretty much every game this season it’s the questions on the offensive side of the ball that establish how Florida is going to do on a lot of nights. I thought they moved the ball well tonight on their way to a solid 45% shooting night and got high percentage looks even late in the clock after the pressure of Nevada could have worn them down. Another encouraging thing to note about the offense is that it was quite efficient despite the fact not a lot of threes were falling. This can be a 3-ball reliant offense and even though they were only 5-18 (28%) tonight their offense still flowed. If they can continue to get good looks in the paint and their 3-point shots start to fall this could be a dangerous team. I thought Andrew Nembhard was incredibly impressive tonight. He had a well-rounded stat line of 8 points, 7 rebounds, and 6 assists but what won’t show up in the box score is how tough he played. Nevada was physical in trying to deny him the basketball all night and he fought through a ton of contact just to get the ball and run his stuff. Nothing was easy for him on offense due to the physicality and size Nevada had on him but he just kept doing his thing and was excellent. He also really locked down defensively, something tough to do considering how much work he had to do offensively. He also helped eventually break Nevada’s press after Jalen Hudson and KeVaughn Allen really struggled it, another thing that shows how Nembhard is wise beyond his years. Mike White is now 5-2 in NCAA Tournament games, a great number for a young coach. Hopefully it can still improve during this run! Nevada is the oldest team in college basketball and played 6 redshirt seniors and a redshirt junior tonight. 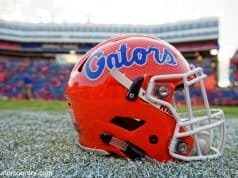 For the young Gators to beat them was amazing and for them to not totally fold after giving up their massive lead shows some toughness. I’m definitely concerned about the way Florida played down the stretch but at the end with the game within a single possession the Gators were the better team. I’m really proud of the performance and I think this team could continue to do damage in the Tournament.